When Carla and Ben moved into their South West London home they were underwhelmed by the interior. With six bedrooms and a large garden it was the perfect home for their expanding family; Bertie (five), Kitty (four), Willa (one) and their pets, including two bulldogs. Although the space available and proportions of the rooms was perfect, the décor was over the top and in need of modernising. The kitchen was the last part of the home that Carla and Ben looked to renovate, and they were very conscious of the impact this room would have on the house as a whole so getting it right was a priority. “The wait gave us time to think about what we wanted to achieve,” explained Carla “so we could make sure we got it spot on”. 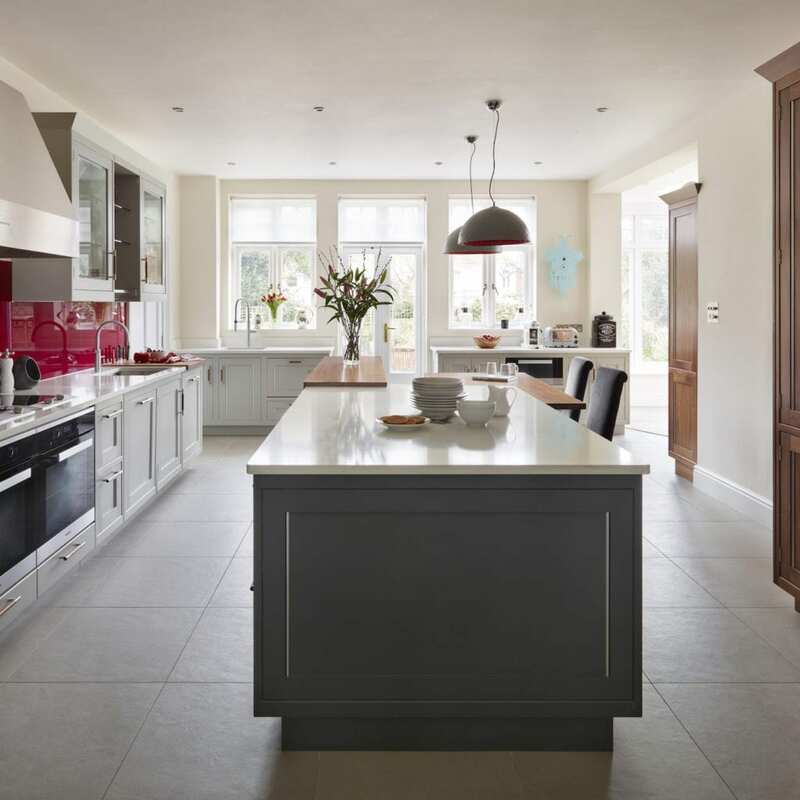 The layout of the kitchen was in need of a re-think as well as updating the aesthetics of the space. Carla and Ben were looking for a modern-classic look that was contemporary but still welcoming. “Because everything Davonport makes is custom-made we knew we could have the room exactly as we wanted it” Carla explained. 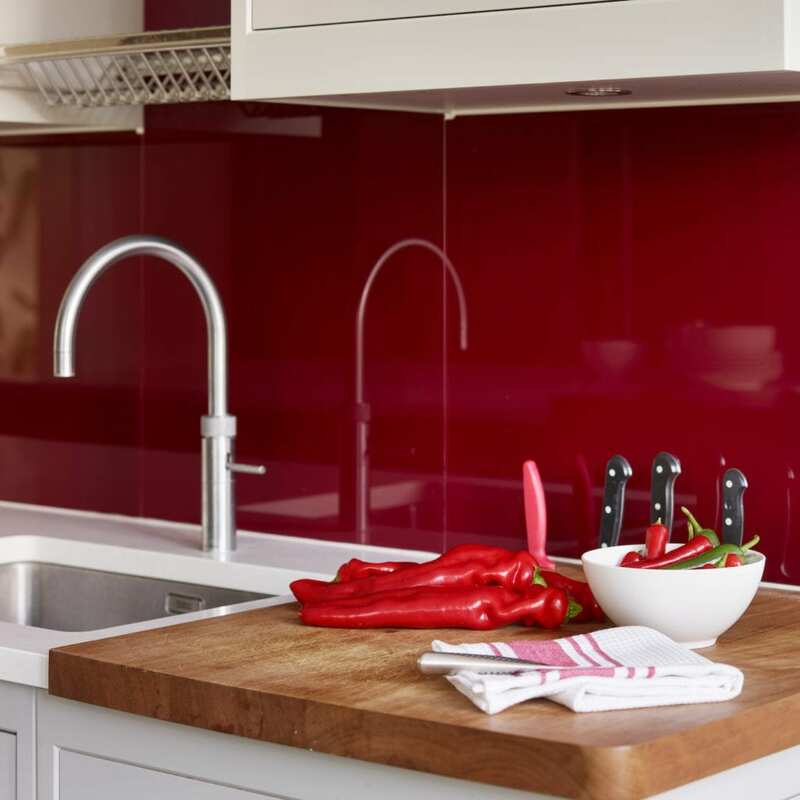 The overall look and feel of the kitchen is one of modern classic design; perfectly contemporary but with a timeless finish, ideal for 21st century living. 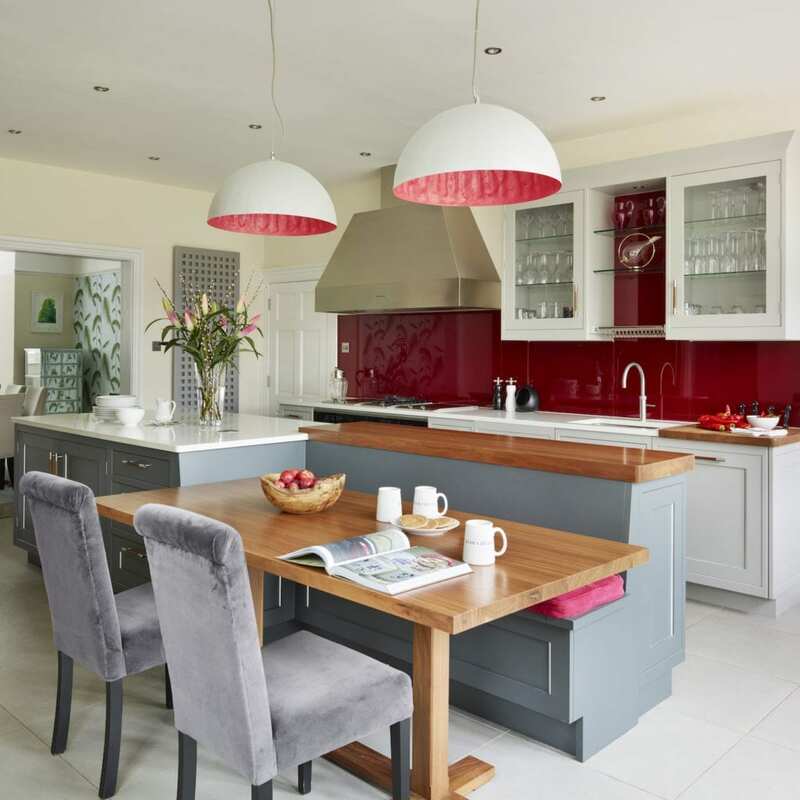 As well as looking great the kitchen needed to be practical for both relaxed family living and entertaining. The design was centred on this dual focus as a warm hub for family life but also as a space to entertain guests. “The layout is practical in that it switches easily from a crazy room full of children and dogs in the day to an elegant space to relax with our friends in the evening. Perfect!” explained Carla. The island is integral to the design, forming the core of this multifunctional kitchen. At nearly four metres long the island is large enough to act as a food preparation area as well as a socialising and entertaining space. The bench seating integrated into the island provides an informal dining space as well a safe place for the children to congregate whilst Carla and Ben cook. With a family TV area to one side of the kitchen and a dining area to the other, the kitchen forms the busy heart of the home. The aesthetics of the room were crucial to the design; all cabinetry was hand painted after installation using Farrow & Ball; ‘Lamp Room Grey’ on the cupboards and ‘Down Pipe’ on the island. The darker tone applied to the island turns it into a focal point at the centre of the room. 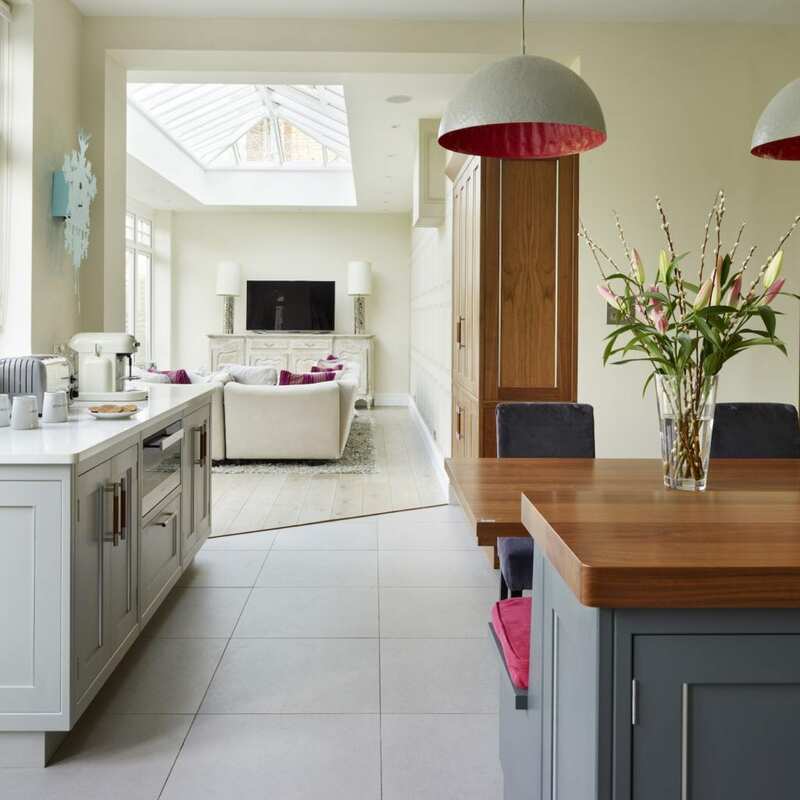 White Quartz worktops used throughout the kitchen lightens the colour scheme, lifting the mix of greys, to keep the space light and airy. 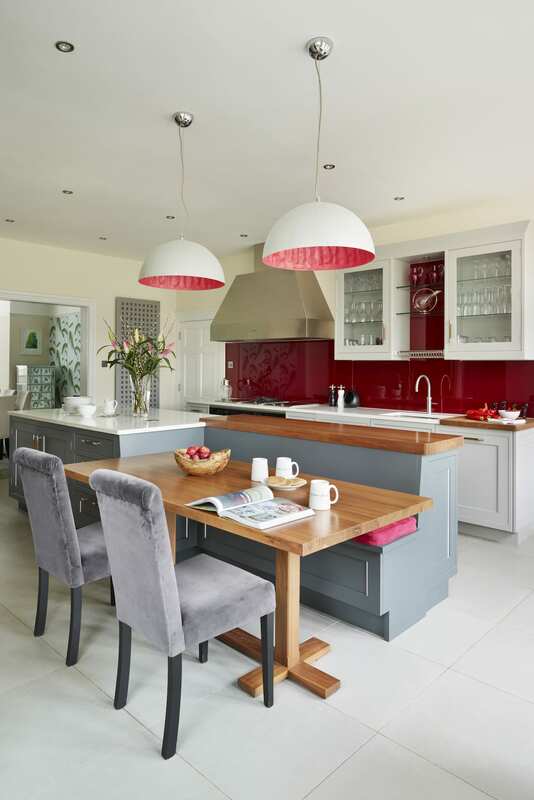 The Merlot glass splashback matches the red cushions on the bench seating; these bright touches of colour give the room personality, breaking up the otherwise neutral palette of colours and uniting the different areas of the space. Walnut accents give the room the warmth that Carla and Ben were looking for; Davonport American Black Walnut is used for the bar above the seating part of the island as well as on the tall cabinetry surrounding the Fisher and Paykel fridge/freezer and the breakfast cupboard opposite the toaster and coffee area. 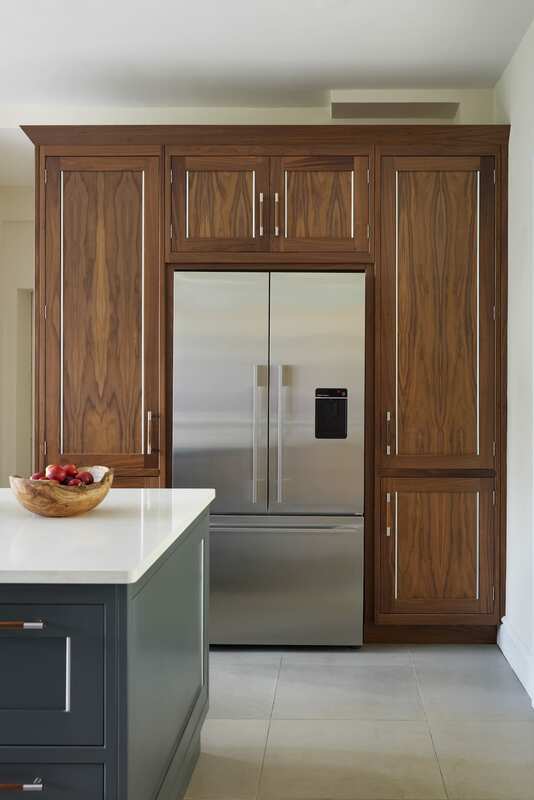 The handles used throughout the design are brushed steel and walnut, again unifying the decor elements and lifting the darker tones with metallic accents. 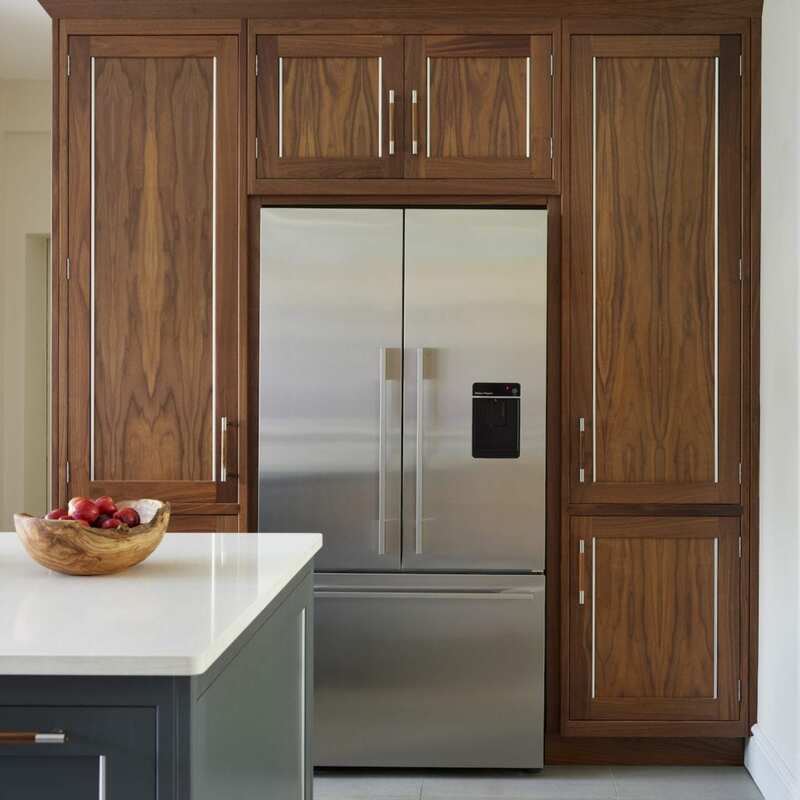 “We love the warmth of the walnut with the cool grey painted finish,” explained Carla. The mixture of materials and colours creates a rich decor scheme, striking the perfect balance between comfortable family home and stylish modern room perfect for entertaining. 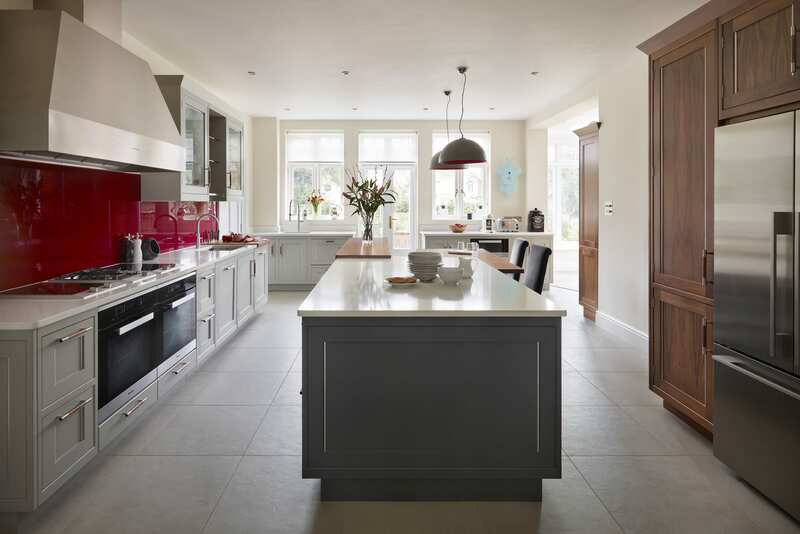 The layout of the kitchen was in need of a re-think as well as updating the aesthetics of the space. Carla and Ben were looking for a modern-classic look that was contemporary but still welcoming. “Because everything Davonport makes is custom-made we knew we could have the room exactly as we wanted it” Carla explained. 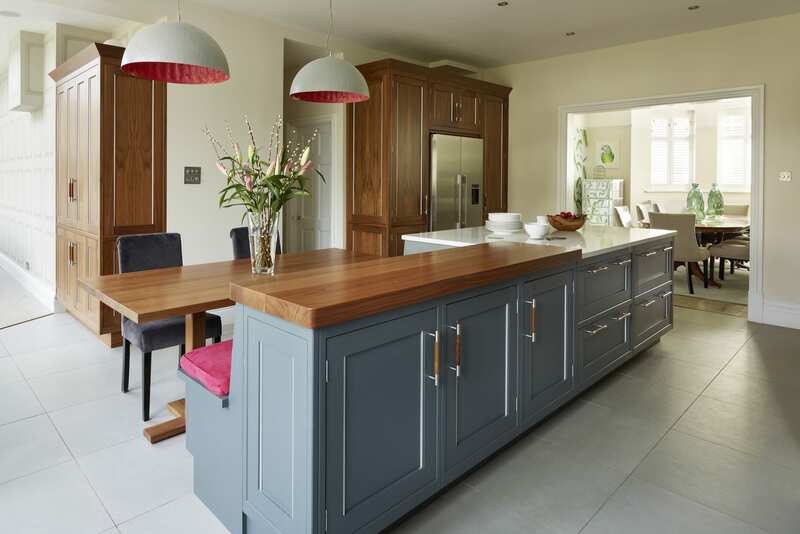 The overall look and feel of the kitchen is one of modern classic design; perfectly contemporary but with a timeless finish, ideal for 21st century living. 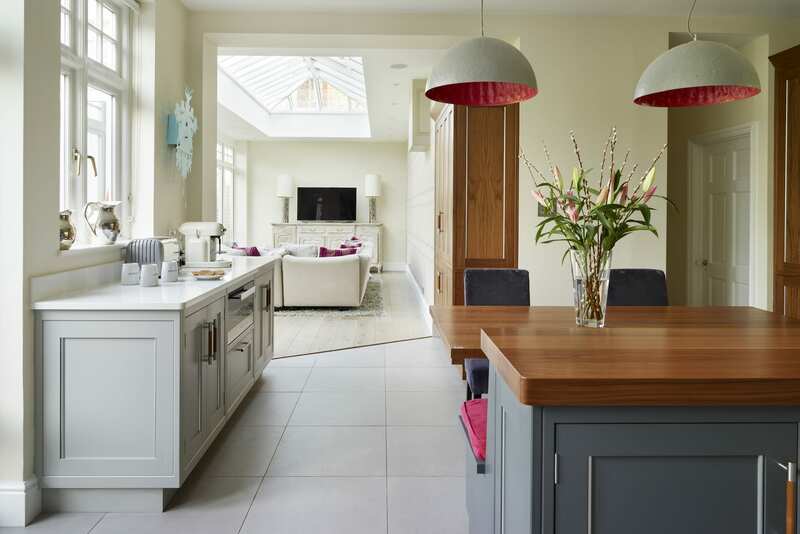 As well as looking great the kitchen needed to be practical for both relaxed family living and entertaining. The design was centred on this dual focus as a warm hub for family life but also as a space to entertain guests. The couple enjoy hosting dinner parties; Ben especially is a keen cook who particularly likes experimenting with Asian dishes, therefore integrating appliances which enabled him to indulge this passion was high on the priority list. A Miele gas wok hob is positioned between two Miele induction hobs, providing Carla and Ben with ample cooking space, and a bespoke stainless steel Westin extractor was introduced into the design in order to cope with the large amount of steam typically let off whilst cooking with a wok. Miele ovens were also integrated into the design, as well a Miele warming drawer that can also be used for slow cooking. In order to cope with the frequent entertaining that Ben and Carla enjoy, their kitchen features not only a full size integrated Miele dishwasher but also a dishwasher drawer specifically for glassware. This generous mix of appliances provides a comprehensive combination of facilities, which allows them to balance ample entertaining with busy family life. 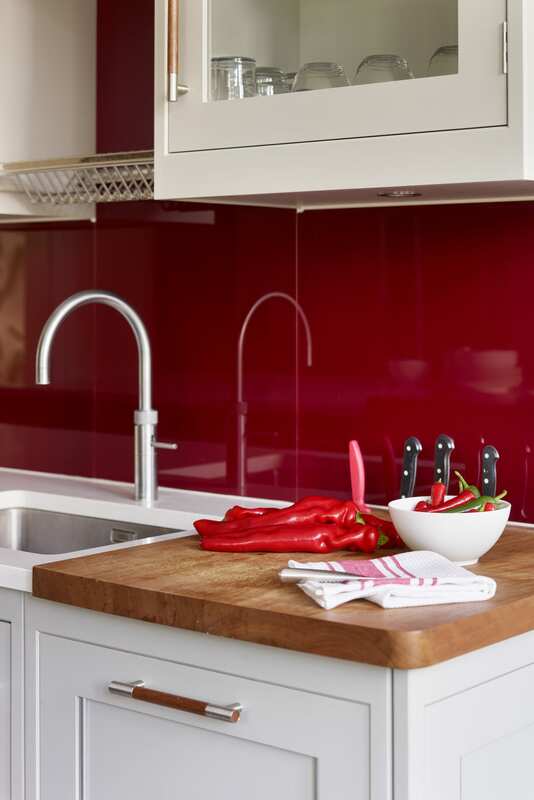 Please visit our Belgravia collection page to find out more about this contemporary kitchen style.